ZooLoo.com launches step-sister site, ZooLoo.TV, bringing original videos, viewer-submitted content and all the best videos online into one place. ZooLoo.com, the complete online environment, announced today the launch of its step-sister site, ZooLoo.TV, bringing original videos, viewer-submitted content and all the best videos online into one place. "We wanted to create a centralized location of the Web's most popular video content," said Executive Creative Director & Co-Founder, Austin Lemme. "ZooLoo.TV is an ever-growing collection of the best videos the Internet has to offer, along with a mix of our own original content." ZooLoo.TV offers videos in a range of categories including entertainment, technology and humor. Fresh content will be added on a regular basis from the best sources on the Internet. Users can also search for their favorites and submit video suggestions. "ZooLoo.TV is a reflection of the development team that built ZooLoo: creative, edgy, up to the challenge and non-traditional," said CEO Jeff Herzog. "It's really an eclectic collection of content that you probably won't see on more mainstream sites. Just like ZooLoo, we're open to ideas and will be enhancing the ZooLoo.TV offering based on user feedback." The site's sibling, ZooLoo.com, launched in beta two weeks ago bringing users a complete online environment around their own domain name. ZooLoo has experienced an overwhelming response since launch, adding users from all 50 U.S. states and 76 countries around the world. ZooLoo.TV and ZooLoo.com are part of the Zog Media suite of companies and are actively seeking partnerships. For more information, visit ZogMedia.com. 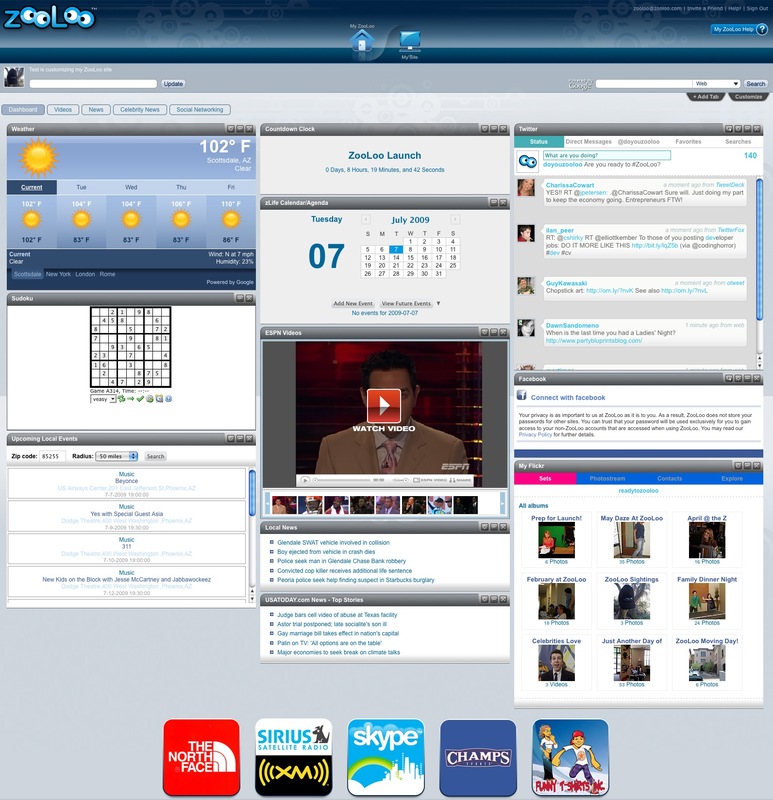 ZooLoo is a complete online environment for today's Internet. ZooLoo is built around your own domain name, providing you one place to create, connect and control anything on the web, including your own site, dashboard, widgets, blog, news from anywhere on the web, social networks, photos, videos, tools to organize your life and everything else online. ZooLoo is part of the Zog Media suite of companies. For more information, visit Zooloo.com. Zog Media is home to the innovation and development of audience-driven media solutions. Its suite of companies includes the complete online environment, ZooLoo.com; ICANN accredited domain registrar, Zog Names; and advertising platform, Z Audience. Zog Media's Founder and CEO is Jeffrey Herzog, recognized Internet entrepreneur and award-winning innovator. Zog Media is based in Scottsdale, Ariz. For more information, visit ZogMedia.com.